Are you down with the fitspo movement? Do you follow these hashtags religiously on all your social media platforms? You’re not alone. And there’s a reason why it’s so popular. An insanely popular hashtag in recent years, fitspo is devoted to promoting proper diet and exercise through images, quotes, and inspirational stories. Women share successes and failures. And sometimes they share progression images, too, so that other women can gain inspiration from the work. It takes work and discipline to meet fitness goals. And it may be difficult to find motivation if the only person to answer to is you. You can come up with a ton of excuses for why you can’t work out today, or why you can start eating healthy later on. But when it comes down to it, the only person you’re cheating is yourself. This is where the idea of “fitspo” comes in. Where do you go when you aren’t accountable to anyone else? Who would know if you cheated on a diet? Or skipped a workout routine? The answer is the other women and followers on your social media platform. With the support of their online community, women around the world are able to take their image of an ideal self and make it a reality. Transform Fitspo takes these ideal to the next level. Find exercise routines, dieting tips, and inspirational stories in this all-in-one fitness blog. Realize a better “you” through help and advice from the community and experts in the field. Have you tried a dozen times to get in shape? And what about that diet you mean to start? Getting the right body means doing it right. And you can’t go it alone. Getting in shape can mean many things to different women. And everyone has different reasons to start. Some have nothing to do with the waistline at all. On the other hand, some reasons may only include weight loss as a secondary desire. What are some of your reasons for wanting to get fit and healthy? Do these reasons sound familiar? You may have a combination of reasons from the list. Often, women have multiple reasons to start an exercise and diet regime. But what ends up happening is they get discouraged by setbacks. Or sometimes they’re burned by fads. And that’s if they’re motivated to start at all. 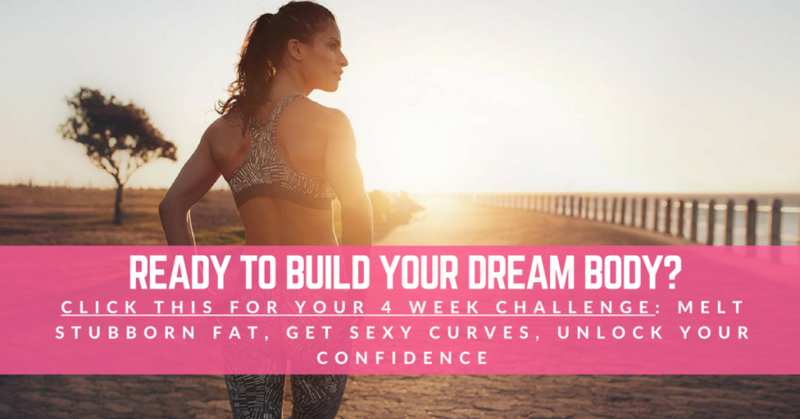 But if you think it’s time to take control of your body and your life, maybe it’s time for the Transform Fitspo 4-Week Challenge. The 4-Week Challenge can help you get on the road to better fitness. This fun program is filled with secret tips and advice to help you trim 10 to 25 pounds in four weeks. Say goodbye to problem areas like that muffin top, bingo arms, and unsightly back fat. The workouts are designed for women of any fitness level. This isn’t another workout where you need a gym membership or an expensive trainer. The routines are simple and varied enough to do at home. Just find 30 minutes each day to commit to your health. In addition, you also receive access to tips to start eating healthy. No, we don’t mean starvation diets and cleanses. Making smarter food choices isn’t about deprivation. It’s about changing the way your brain is hardwired to think about food. Taking that step to transform your body involves so much more than one exercise program or a miracle diet. It’s about ditching bad habits and forming healthy ones. And we can help you get there. Are you tired of being left to flounder when you start a new program? That’s not what we’re about. We’re here to help. So whether you want a different workout routine, meal plan advice, or moral support, we’re always here. Check out our pages to get answers to common questions. Or feel free to drop us a line if what you want to know isn’t covered on our website. We want to be a part of your fitness progression. Whether it’s celebrating a triumph or commiserating over a setback, we’re here for you. After all, we’ve been in your shoes.